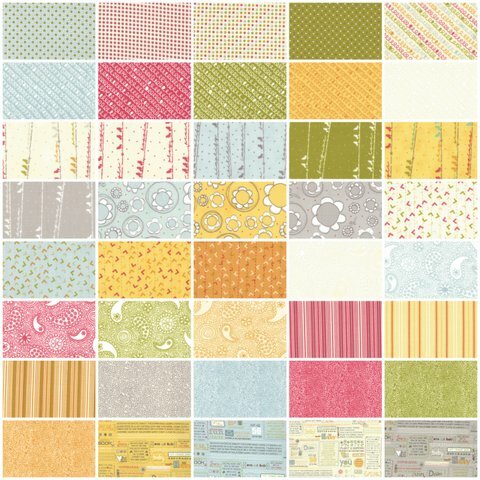 Listed today in my little e-shop are three new pre-release pre-cuts from Moda – Honey Honey by Kate Spain, Indigo Crossing from Minick and Simpson and Noteworthy by Sweetwater. Honey Honey is buzzing with the sweet freshness of a summery seaside cottage garden in full bloom. Ocean breezes whirl throughout the collection that features a mix of lush border gardens, hydrangea, asters, lavender, and kaleidoscopic lace and honeycomb patterns. 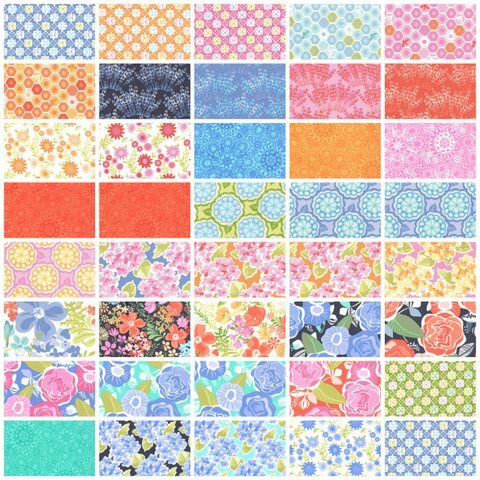 Lively tea roses in vibrant shades of coral, blush and violet are ready to be snipped and stitched into whatever project is in your daydreams! So take a stroll, and see what the tide washes onto the shores of your creativity. 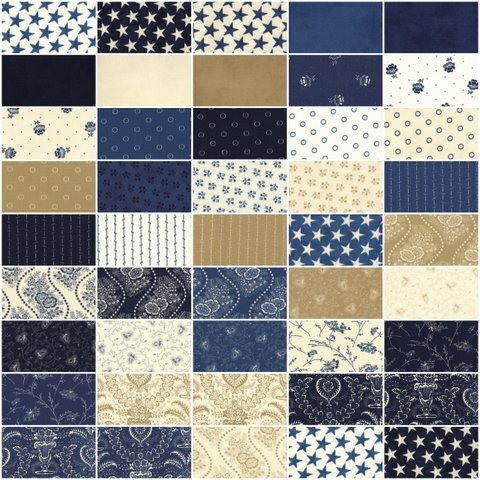 No other fabric evokes 19th century America more than an indigo cotton. Indigo – the color of ink on paper; the color of denim; the color of the star covered flag – is as crisp and clean as a spring morning. Our collection of indigoes is taken from snippets and scraps from sewing baskets and linen cupboards, as well as from our own collections. We love a stack of indigo and white quilts stacked to the ceiling! We love them hanging on a line and snapping in the breeze. We love the geometric beauty of blue and white. Freshly laundered and smelling of lavender, an indigo and white quilt is true comfort. Remember when we actually wrote things down with a pencil and paper? Today there is an app for all of that. Noteworthy was inspired by that pencil and paper time. I used to love doodling in school and my notes often looked like the “Bucket List” print- with random lists, stars and flowers all over the page. Our family phone book was covered with doodles- much like the prints from this line. Noteworthy was also inspired by the important things in life, and we hope the “Bucket List” print will inspire you to think about your own bucket list – about what is important to you. The color scheme of this collection is one of our favorites. It’s fresh, happy and makes me long for summer. Just like when I was doodling in high school- I was always longing for summer! 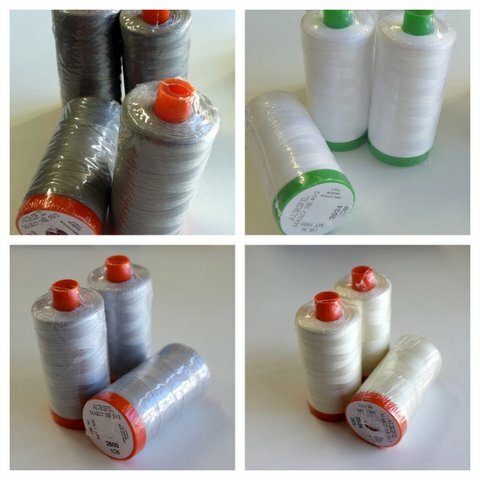 And basic Aurifil colours are back in stock. Only $12 a spool. are you getting indigo crossing in a jelly roll Jane??? Love it for a boys quilt! I am loving honey honey! I can't get any until we have moved, but I am looking forward to playing with it over Christmas! Do you know when you will be getting any more clover binding clips? I want to grab a few of those too.